✅ STARTING (INITIAL POSITION): Stand with your knees slightly bent and, holding a pair of dumbbells in front of you with your palms facing each other, bend forward from the hips like a jackknife, keeping your back flat and your head up. Allow your arms to hang straight down from your shoulders and bend your elbows slightly. ✅ MOVEMENT (ACTION): With palms facing together, slowly lift the dumbbells up (to ear level) and out to the sides of your body, pulling through the rear delts and rhomboids. Pause a moment at the top of the motion before slowly lowering the weights back down to the start. Avoid the use of momentum by lifting the dumbbells slowly and deliberately, and imagining the distance between your shoulder blades getting smaller as you raise the weights. ✅ Follow these additional tips to ensure that you perform this great rear deltoid exercise safely and effectively. Bent over at the waist at a 45-90 degree angle with your back flat. Remain spine in one position. Look for your hands to move not only back but away (or out) from your torso in a slow and controlled fashion. Make a small pause at the top of the movement. Avoid any spinal, hip, knee, or head movement. Evade elevating your shoulders towards your ears or extending your arms forwards, towards the ground, in the bottom position. Avoid moving your shoulder blades from their down and flat position as your arms descend towards the floor. Rounding your back during this exercise may cause injury to your back or spine. Stand up straight, holding a Barbell in front of your thighs with both hands. Your hands should be at the three and nine o’clock positions. Keeping your back straight and your elbows slightly bent, exhale as you raise the Barbell out in front of you in an arcing motion until your arms are parallel with the floor. Inhale as you lower the Barbell in a controlled manner to the starting position. 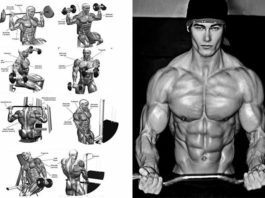 To really get that muscularity and shape into your shoulders, you need to make sure that you train all sides. Quite often people focus on the both the side and front delts, forgetting the rear (posterior) delt. Well developed rear delts will help to keep your shoulders balanced. Furthermore, they will help to prevent a lot of shoulder injuries and rotator cuff problems as well. Very often the front delts are strong from lots of pressing movements (bench presses, overhead presses, etc.) 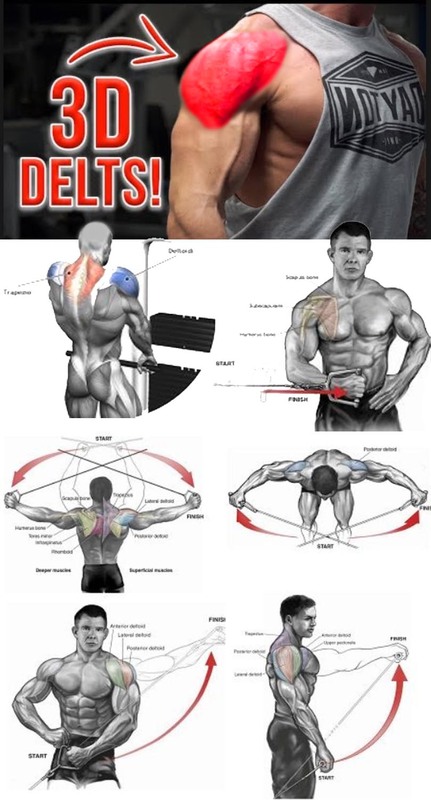 so they over power the rear delts. Since this is a small muscle group you should train with fairly light weights and do higher reps, between 10-20 reps per set. Focus on feeling the muscles working with each rep. 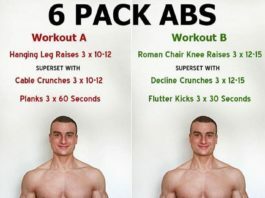 This is where reverse cable crossover exercise can be very useful weapon. Follow this detailed exercise instructions in order to perform reverse cable crossover using perfect form. 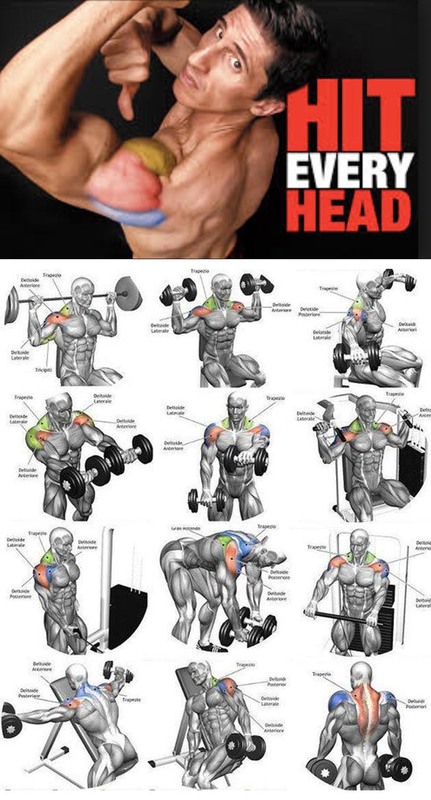 This is the only way you can obtain maximal results from this valuable rear deltoid exercise. ✅ STARTING POSITION (SETUP): Adjust the pulleys to the appropriate height and adjust the weight. The pulleys should be above your head. Attach the stirrup handles to the highest points of the crossover machine. Stand in the centre of a cable crossover apparatus (between two high cables) with your arms extended to the front. Start with hands crossed in front of you at shoulder height (or just little above) with the left high cable in your right hand, the right in your left hand. ✅ EXERCISE EXECUTION (ACTION): Using your rear delts, pull your elbows out (to the side) and back as far as possible (until your arms are in line with your back). Return to the initial position (where your right hand is directly in front of the left shoulder and your left hand in front of the right shoulder) with a controlled movement and begin again. Repeat for prescribed number of repetitions.